Did you know that the BMI chart for men and the BMI chart for women were the same chart. Furthermore, the cdc and the nhs recommend that for men and women of the same height that they should be the same weight. Whoa, before I began to research this, I would have thought that men should weigh more than women. When I was a little boy reading comic books, I remember when The Hulk came out....now there was a masculine body. Fast forward 50 years and I still do not have that body. Perhaps if you want to personify masculinity, The Hulk has the ideal weight, but men, if you want to be healthy you are going to have to weigh a little less. Women, Many of you may be facing the opposite role models. How many of you have wanted to have the figure of a runway model. Perhaps if you want to be a model that is your ideal body weight, but if you want to be healthy, you will want to weigh a little more. You are not a little girl anymore, and should not be striving for a girly figure. Oh, I can think of one difference between a BMI chart for men and women. 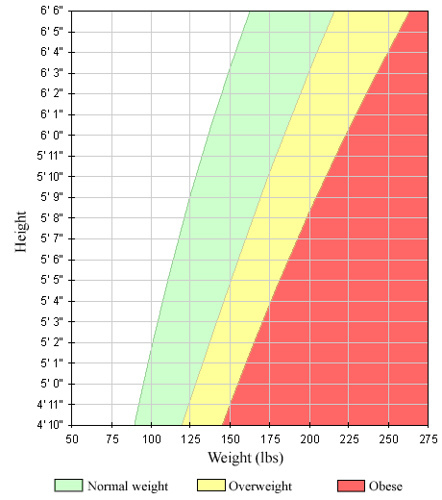 A BMI chart for men will probably be shaded in blue and yellow while the BMI chart for women will be in pink and green. Since this is a BMI Chart for Women and Men, I will use pink and green. In this chart you find your height in inches on the left and then go to the right until you find your weight, then go up until you find your BMI. Adolphe Quetelet is the one who is given credit with coming up with the BMI formula. His formula was used just to describe the shape of normal men in his home of Belgium. He was not doing Medical Research. Stay tuned, because because BMI is not perfect and because being overweight is so important, I feel certain that new tools are in our future. What is the best way to know your healthy ideal weight? Do you have a great suggestion about this? Share it! Pretend that you are at your doctor’s clinic for your annual checkup. You are concerned or wanting to improve your weight. What kind of tests would you want done or what kind of information would you want to be given? Here is the same BMI Chart for Men and Women, but in a different format. This is once again the same information, but uses cm and kg (the metric system for those who weight themselves in kilograms. Is the BMI formula the best formula? Should there be a different exponent? A Different BMI Exponent.